In many Western countries, household indebtedness is rising to levels constituting a financial risk for individuals and a threat to financial stability. The growing household debt applies to both consumer loans and housing loans. 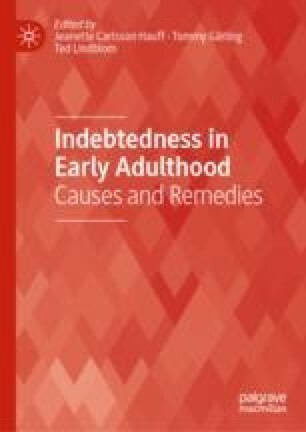 In Sweden, which is the country that we focus on in this book, household indebtedness has over many years grown to become among the highest in Europe. Young adults are for several reasons a particularly vulnerable group. An interdisciplinary research program was launched to study young adults’ borrowing from three perspectives: (i) the perspective of the young adult borrowers, (ii) the perspective of financial institutions that are lenders to young adult borrowers, and (iii) the legislative perspective of regulation lending and borrowing to young adults. Each perspective is presented and discussed. Almenberg, J., & Widmark, O. (2010). Numeracy, financial literacy, and participation in asset markets (Working Paper). Available at SSRN http://dx.doi.org/10.2139/ssrn.1756674. Goddard, C. A. E., & Wagner, W. (2012). Regulators should encourage more diversity in the financial system. Available at www.voxeu.org.